If you want to understand what it’s like to be a slave, all you have to do is realize that slavery means to work on the behalf of someone else on a non-voluntary basis – without receiving compensation for your labor. That means, you work for the benefit of someone else for free, whether you like it or not. Now, a person is free to volunteer their time and effort if they wish. But, at some point, if you find yourself working for someone else for more hours than you would like, that then becomes slavery. What most people don’t realize is that they are working on behalf of others for about sixty percent of the time that they’re working. That’s right! Sixty percent (60%) of the time. If you add up all the sales tax, gasoline tax, usage tax, income tax and all the various and sundry hidden taxes the government would rather you not be aware of, it all adds up to about sixty percent. Since time is money, you are losing about sixty percent of your working life, sixty percent of your income in taxes which are largely distributed to people who work for the government, in order to pay their government salaries. The rest of the funds go mainly to things you’d never buy or to services you’d never need, including to those who do not work and to government-funded experiments that determine which brand of chewing gum grasshoppers prefer, or something equally ridiculous. Very little of this funding goes to servicing the national debt, the maintenance of our national defense or roads and bridges. So, that means that you’re a slave or, if this sixty percent tax rate is OK with you and you support a government that taxes at that rate – you support slavery. Usually, the people who support the high tax rate are the people to whom your tax dollars are going! You see, career politicians go around promising these groups of people who don’t want to work – everything under the sun. This is group B. 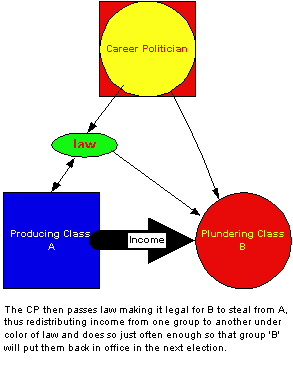 Those people, believing these politicians, put them in office where they pass legislation that makes it legal for those people in group B to steal from group A, the people who pay taxes and at a sixty percent rate, group B has enslaved group A. If “N” is 20%, then a state of slavery exists when “X” is 60%. Where do YOU set “N”? Now, there’s the issue of “reparations for slavery” where certain segments of the black community are demanding that they be compensated for their ancestors’ slavery. Isn’t that yet another tax on those from whom those funds will be taken? 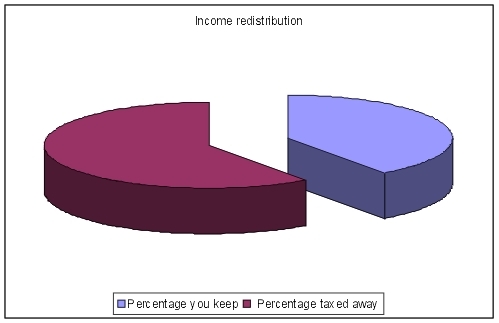 Isn’t that more redistribution of income? Aren’t we working, producing people already enslaved under our current system of taxation? Will we be eligible to receive “reparations” for the socialist slavery we’ve been crushed under? The “reparations” movement is democracy (Marxism) by any definition. Who in the hell do they think they’re fooling? Slavery exists in this country RIGHT NOW and it is the working, producing people of this nation who are enslaved! Why do you think the “government” is trying to take away all your guns? You must remember that free men own guns, slaves do not. Yes, our official status as slaves is almost complete. All the collectivists/statists have yet to do is take away our means of resisting their advancing agenda to raise taxes to the communist rate of 100% so that it can be “redistributed to each, according to need”. Yeah, right. And I have a bridge in Brooklyn that I can let go cheap. Nine times out of ten, the promises of the career politicians are just "bait" to get his patrons to continue to vote for him. Only the tenth promise is kept so that the career politician can show supposed "results", that he's effective as a "representative". Then, the blame for the other nine broken promises are heaped upon anyone who appears fiscally responsible. Meanwhile, the career politician's high salary is ensured into perpetuity or until term limits take effect. Meanwhile, most of these career politicians are working to fulfill a globalist agenda, leveraging their position while making their supporting constituents dependent on "big brother". 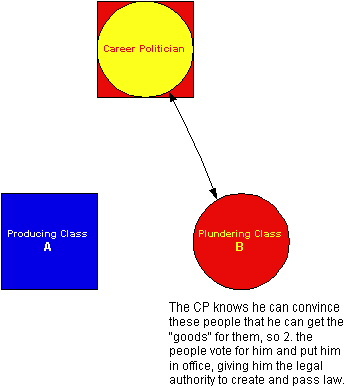 Of course, by "working for the people", the career politician is actually passing laws that will transfer wealth from group "A" to group "B"
By any other name, this is legalized theft, it is redistribution of income, "leveling the playing field", equal outcome (as opposed to being equal OPPORTUNITY). This is the cornerstone of communism, the form of slavery where one class, the producing class - is enslaved by those who exercise democracy (mob rule) to override individual libery with laws that make it legal for them to steal from the producing class. In reality, however, nine times out of ten, your representatives are passing laws which DO extract the wealth from the producing class and the "redistribution" goes to the ruling elites, the "shadow" government of international banksters - in the form of taxes that pay the interest on the national debt, which is held by the NOT Federal, Federal Reserve, a private banking cartel. It is only about one time out of ten that the wealth is actually redistributed to the other "peasant" class. Welcome to the People's Demokratik Republik of the United Socialist States of America, the "PDRUSSA". That's not all. The UN has proposed a worldwide tax. That's right. You will be required to pay a UN tax at some point - if we maintain contact with the UN. Don't believe me? Maybe the details will convince you. Think about this: If you want big government up to and including global government, you are asking to be enslaved because as government increases, freedom diminishes. At some point you'll find yourself working for the state under majority rule where no inalienable individual rights are recognized. Finally, consider that free, sovereign men own and bear arms - slaves do not. 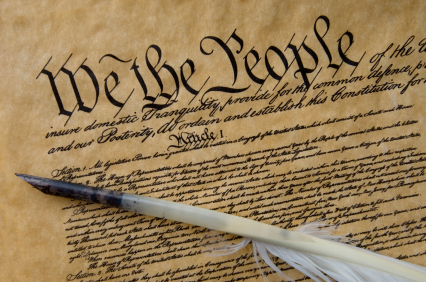 In that light, isn't the so-called "gun control" crowd really just trying to disarm we the people - so that they might take away our means of resistance to any who would try to enslave us? Well, if you have any doubts about that, be sure to check out the Ninth Circuit Court's latest ruling as of December, 2002.